"I eat goals for breakfast!" I was planning to highlight my husband’s commentary to give you both perspectives, but he didn’t have a lot to say in the first half. Milan came out with energy and pace and were greeted by a Juventus who didn’t seem to recognize this team. Muntari showed his worth right away, looking dangerous in the 9th, and then had a spectacular challenge to win the ball in the 12th. Then, after Buffon had to punch out a dangerous kick that was deflected by Marchisio, in the 15th, former Juve man Nocerino capitalized on an error by Bonucci and put it straight into the back of the net, 1-0 Milan. In the 20th, Allegri was looking for trouble “talking” to the fourth official, who happened to be our dear friend Rocchi, who was suspended the last time he reffed for us. And it was all surrounding a call that went Milan’s way, when Mexes was climbing all over Borriello’s back. Personally, I thought that was just some kind of old Roma handshake that went a little too far. Muntari, you deserved that goal and a whole lot of credit, too. Bravo. In the 23rd, Silva potentially sacrificed his ability to procreate to block a Vidal kick point blank. Here’s hoping that he’s okay. Certainly, it redefines the phrase, “taking one for the team.” Speaking of taking one for the team, Muntari scored a great goal off of a rebounded Mexes shot that was saved by the linesman, since Buffon couldn’t quite do it. Buffon did quickly put it back into play, even if the center ref had initially signaled it a goal. And Juventus, who were not all busy celebrating, quickly took advantage on the counter attack and forced Abbiati into his first brilliant save on the night. Thank you, Abbiati, a pox on you Tagliavento and company. And sorry, Muntari, that was brilliant and you deserved the credit. In the 29th minute, Pato touched the ball. Things started getting more physical as desperation set in for Juve, who had no answer to the new bromance of Urby & Robinho. In the 32nd, van Bommel clipped Vidal trying to jump over him. And in the 36th, Thiago Silva was shown a yellow card for a foul on Quagliarella from behind. Most likely, he wasn’t able to see straight from what I suspect was blinding pain, but he collected the card, nonetheless. 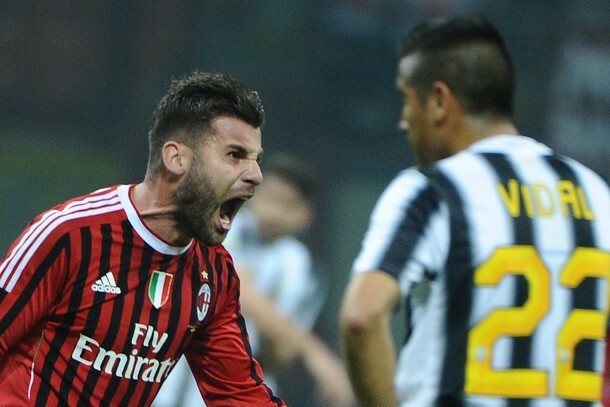 In the 41st, Barzagli also earned a yellow for a foul on Urby. "Hey, baby! What are you doing after the match. Wanna go someplace?" But the big news was Antonini. In the 35th minute, he made a successful pass. After that, he thought he was the big man on campus, pushing Lichtsteiner in the back with both hands, avoiding a call perhaps because no one in their right minds would do that. Even at the half, when everyone was leaving the pitch, he was mixing it up a bit. 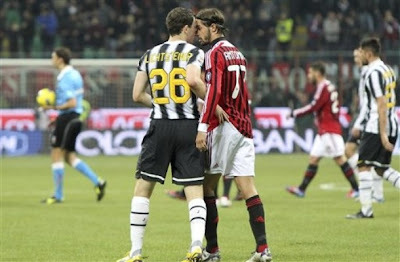 Lichtsteiner had taken a knock to the head right at the end, and Antonini wasn’t smart enough to leave him alone. He’d better hope that Mesbah plays in the Coppa instead. We are as shocked as you, Allegri. Please let it happen again. At the half, a MIRACLE occurred. 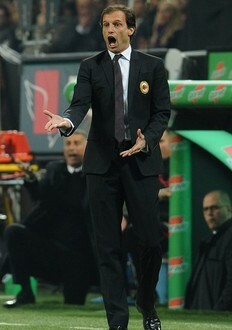 ALLEGRI SUBSTITUTED. That’s right, El Shaarawy came on for Pato, who clearly wasn’t as match fit as Allegri had hoped. But the bigger story here was that Allegri subbed, and not for an injury, before the 75th minute. Wow. But Conte also subbed on Pepe for Estigarribia, who had also been largely ineffective. 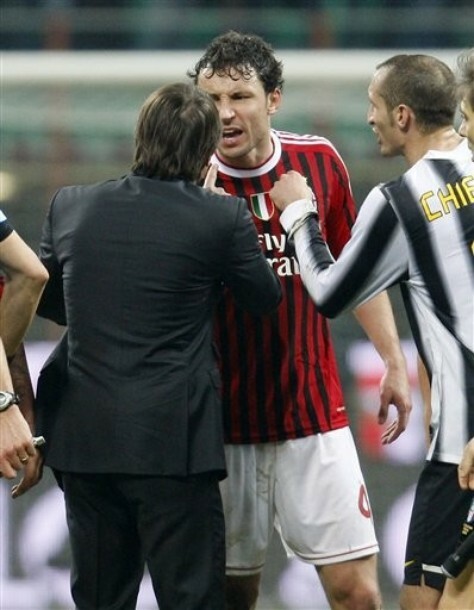 Then, in the 46th, the Roma Connection took a very ugly turn as Mexes punched Borriello. If he doesn’t get a 3 match ban for that, then there are no gods of football. Disgraceful. Everyone knows that’s Ibra’s thing. And he only does it when Allegri won’t rest him. Or when someone tries to choke his teammate. Actually, none of it has any place on the pitch. If you have a problem with someone, take care of it on your own time. Or send Gattuso. In the 54th, just after Robinho was fouled just outside of the box, Conte made his move. He took off Mexes’ girlfriend, Borriello, and put on Vucinic, who was probably the person who should have started for Juve. He had a shot wide and was making things happen and creating space, when in the 69th, Chiellini crossed one in for Quagliarella, who force Abbiati to make yet another brilliant save (and also got the hopes up of someone on the other side of the couch here.) But Quagliarella was promptly subbed off for ex Milan youth Matri, who also played under Allegri at Cagliari. And that’s when things started getting dangerous. You big, bald beautiful thing, you. In the 72nd, Allegri, realizing that our midfield had spent most of their energy in the first half, and wanting to protect the lead, brought on Ambrosini, the only midfielder on the bench, for Emanuelson, who was fantastic on this night. It was in the 72nd that Karma took its toll on the guy in the Del Piero jersey here. Matri scored a goal, but it was called back (wrongfully) for offside. Then Mexes, who had been playing more like his Roma days, was finally shown a yellow for a foul on Matri. In the 81st Muntari had a bit of a nasty tackle on Pirlo, sliding in from behind. By definition, it could have been a red, but I think Tagliavento was smart to give him yellow. Just two minutes later, though, all of Milan’s great play in the first half and their tenacity was undermined by a goal by Matri. 1-1. I was very disappointed that Storari didn’t come to “celebrate” again, as last week he inflicted head injuries on two Juventus players celebrating Quagliarella’s goal. Oh, well. They probably sat on him to keep him from creating more injuries again. It seemed like this was destined to be the final score, but it wasn’t for Milan not trying. Or for fatigue and emotions ruling. In the 89th, Vidal put in a nasty challenge on van Bommel from behind that earned him a red, but stopped the play. Juventus on 10 men. Just a minute later, Pepe fouled Robinho to earn a yellow. Try as they might, Milan couldn’t pull another one back. Karma may have intervened after Muntari’s goal when late in the game, Matri was also denied a goal. But Karma didn’t make up for the momentum and confidence that Muntari’s goal would have given to Milan, and the lack of the second goal kept Juve in the game mentally, too. Plus, Milan were the better team on the night, if only marginally so. The most heartbreaking thing were the bandiera spectators Inzaghi & Del Piero. What a very different game that would have been to see either or both of them, just for one last time.